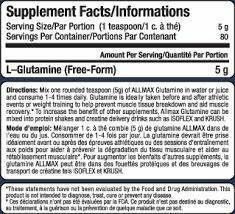 AllMax Nutrition uses only the purest raw ingredients. Our Glutamine is not heat or chemically treated. Glutamine is highly in demand throughout the body. It is used in the gut and immune system extensively to maintain optimal performance. 60% of free-form amino acids floating in skeletal muscles are L-glutamine. 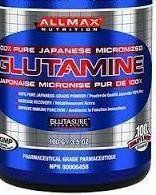 L-glutamine plays a very important role in protein metabolism, and it appears to be a very important nutrient for body builders. * When supplemented, it may help body builders reduce the amount of muscle deterioration that occurs because other tissues that need glutamine will not rob the glutamine stored in the muscle cells. * If you are unsatisfied with the quality or freshness of this product, please contact us immediately.